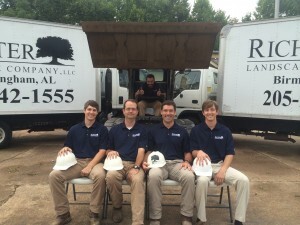 John Richter accepted the ALS Ice Bucket Challenge and challenged The Richter Landscape Company Staff. Jason Cooper, Graham Wiseman, Andrew Martin all accepted and Jackie Carroll assisted in shooting the video. We thought this would give the entire RLC team a few laughs on a Monday afternoon and help support fight against ALS. Everyone had a great time. The RLC Team maybe enjoyed this too much. It sure looks like Charles Barefoot, the machine operator, did! Click here to see the video.